JWU is a participant of the Principles of Excellence and Post 9/11 GI Bill programs. 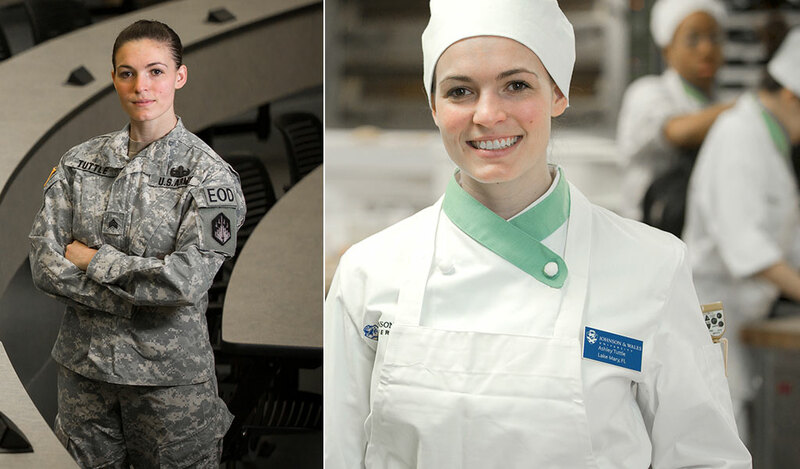 You have the discipline — now earn a degree at JWU, named a Top Military Friendly School by GI Jobs. At JWU, you’ll find a variety of professionally-focused on-campus and online degree programs. We offer small classes in a supportive atmosphere taught by faculty with industry experience, and an uncommon depth of career services. Johnson & Wales University is a Yellow Ribbon participating institution. JWU’s contributions to help students cover their college expenses are matched dollar-for-dollar by the federal government. We are a proud participant of the Principles of Excellence and Post 9/11 GI Bill programs, and we are a signed institution with the DoD MOU. Our dedicated staff is here to help you through the admissions process, and there are more online resources that may also be of assistance to you. The College Navigator is a consumer tool that provides school information to include tuition and fees, retention and graduation rates, use of financial aid, student loan default rates and features a cost calculator and school comparison tool. Paying for College can be used by prospective students to enter the names of up to 3 schools and receive detailed financial information on each one and to enter actual financial aid award information. Complete the application for Education Benefits to activate benefits. Apply to JWU at apply.jwu.edu. Submit Certificate of Eligibility (COE) or 28-1905 (CH 31) to School Certifying Official (SCO). 30 days prior to term starts: fall, winter, and spring the SCO automatically submits certification to the VA. Summer term the SCO emails students to verify the use of benefits and submits certification once student confirms. Complete the FAFSA, and use JWU’s school code: 003404. Chapters 33 and 31: Tuition goes directly to Johnson & Wales University. Student receives Monthly Housing Allowance one month in arrears during active enrollment dates. Payments for Chapters 30, 32, 35, 1606, and 1607 are paid directly to the student.